#1 Keto Fried Chicken Recipe - Low-Carb "Juicy Thighs" Dripping with Flavor! This succulent homemade Keto Fried Chicken recipe is perfectly crispy and crunchy with not so secret herbs and spices. Taste great served with a low carb side dish of cauliflower mash. 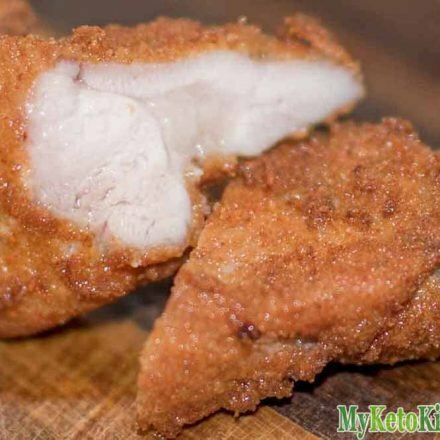 This keto fried chicken recipe makes use of our deep fryer that we use to cook our Low Carb Buffalo Wings. Ensure you check out our article on the Best Deep Fryer Oils for recommendations of oils and fats. For the purpose of this recipe, we’re using peanut oil to fry our no flour crumbed chicken breast. Coat chicken in garlic powder, celery salt, chili powder, and dried oregano, mixing well to ensure all the chicken is covered. Leave to marinate for half an hour. Meanwhile whisk the eggs and cream together. In a separate mixing bowl combine almond flour and powdered parmesan, then pour onto a tray ready to bread the chicken. Turn the deep fryer to 180 degrees Celsius and allow to heat up. Dip each piece of chicken in the egg mix and then roll in the almond meal and parmesan mix. Set aside on a tray until ready to fry. Place chicken in the fryer basket, remembering not to over-crowd the fryer. 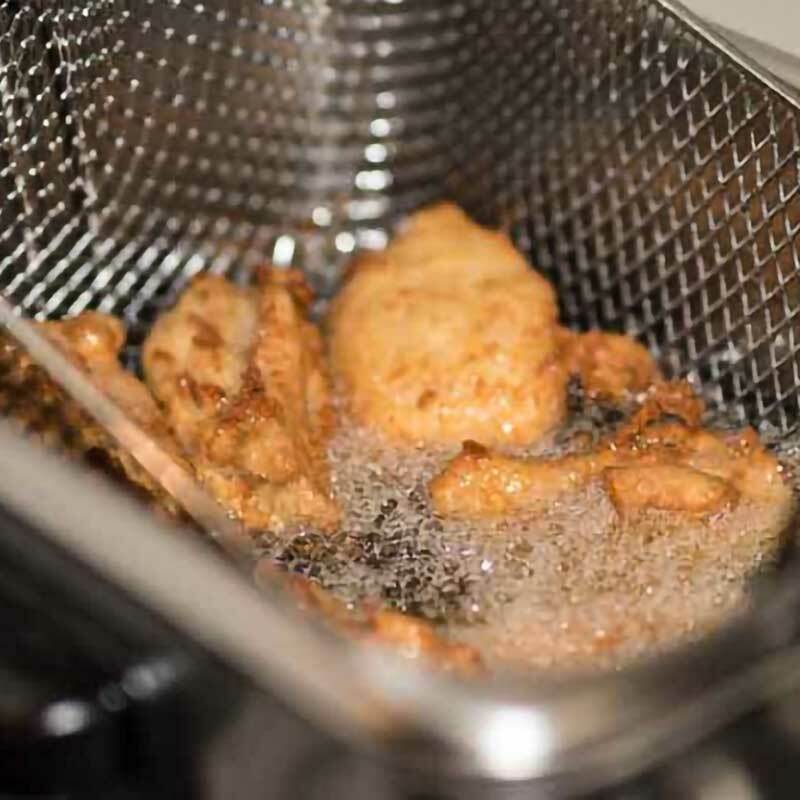 I have a small fryer and put 6-8 pieces of chicken in my basket, this will prevent the peanut oil temperature from dropping too quickly and allow the chicken pieces to be totally surrounded by the oil and not stick to each other. Fry the chicken for 5-7 minutes until it is a dark golden brown. If you are unsure whether the chicken is cooked remove one of the pieces and cut through the thickest area to check. Once cooked through the chicken is ready to eat. A delicious, succulent, Keto Friendly take on Southern Fried Chicken. coated in our "Secret Breading Ingredients" then deep fried until golden brown. They're Juicy and Dripping with Flavor! Cut each chicken thigh fillet into 3 evenly sized pieces and place into a bowl. Coat chicken in garlic powder, celery salt, hot chilli powder and dried oregano, mixing well to ensure all the chicken is covered. Leave to marinate for half an hour. Meanwhile whisk the eggs and cream together. In a separate bowl, combine the almond flour and powdered parmesan, then pour onto a tray ready to bread the chicken. Dip each piece of chicken in the egg mix and the roll in the almond meal and parmesan mix. Set aside on a tray until ready to fry. Place chicken in the fryer basket, remembering not to over crowd the fryer. I have a small fryer and put 6-8 pieces of chicken in my basket, this will prevent the oil temperature from dropping too quickly and allow the chicken pieces to be totally surrounded by the oil and not stick to each other. Traditionally the breading used to coat fried chicken is very high carb due to the use of various ingredients (depending on the recipe) like breadcrumbs and wheat flour. So regular fried chicken is not keto friendly. However, when making our Keto Fried Chicken recipe those high-carb breading ingredients are replaced with low-carb almond flour (meal). To make a larger batch of Ketogenic Southern Fried Chicken Thighs, simply adjust the serving amounts in our easy to use recipe card above. 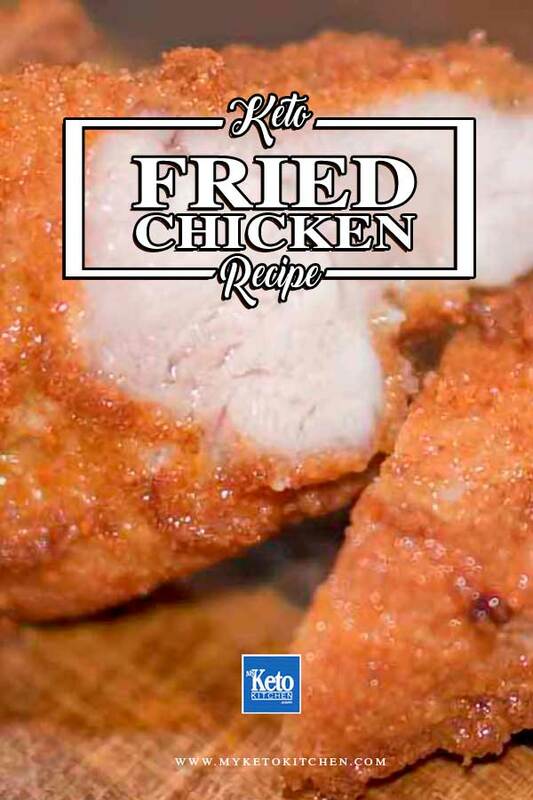 Will this recipe work in an airfryer? How long should whole thighs be fried in skillet? For whole thighs I would recommend sealing them in the skillet then finishing them off in the oven for 15-20 minutes depending on their size. What oil is being used to fry? 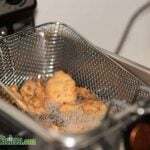 When I made the recipe I used Peanut Oil, as the deep fryer used has an exposed element. 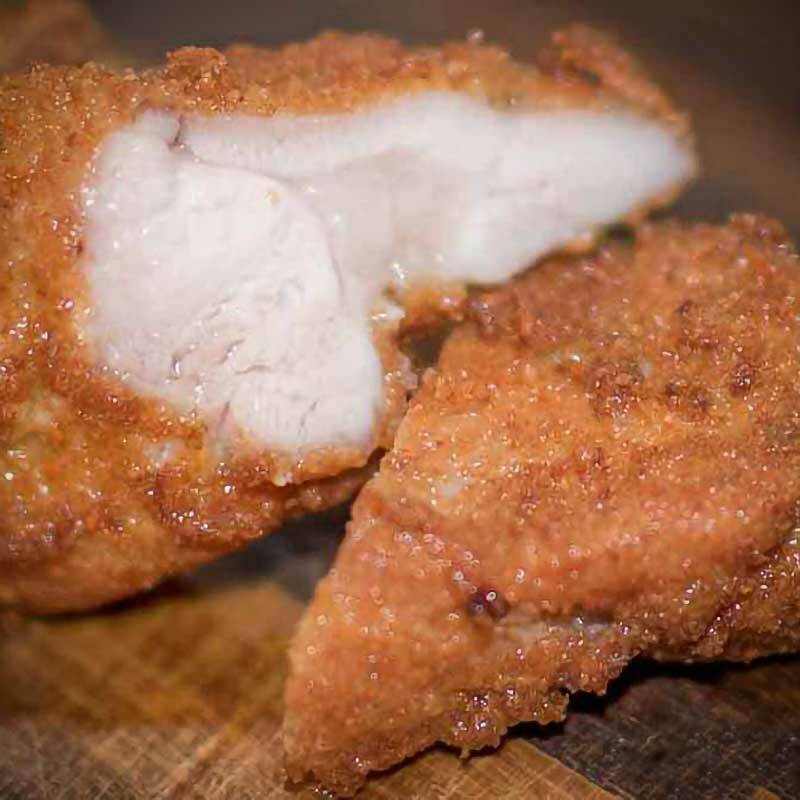 However, I would recommend using either lard or tallow (But do not use lard or tallow in that type of deep fryer, you must use a deep fryer “without” an exposed element when using lard and tallow) – check out the link to our article about choosing the best oil in the post above the recipe for more options. This looks amazing. Can this recipe be made/adapted to using breast meat? Delicious, crunch, juicy and easy to prepare, will definitely make again! Glad you enjoyed it Jody! Hello, I dont have a deep fryer and my little one is allergic to peanut. Is it possible to use a regular frying pan? And for oil any other suggestions? I recommend frying in tallow or lard, they are both very flavorsome fats with a high smoke point. I haven’t tried shallow frying in a pan, but I don’t see any reason why it wouldn’t work. I’d love to know how it goes for you!